I was unable to go to the Royal British Legion, Kyrenia Branch, Poppy Ball this year, but I am always amazed at the amount of hard work that volunteers put into creating themes that are appropriate in remembrance of past servicemen and their service in the United Kingdom Armed Forces. a very important and key role. 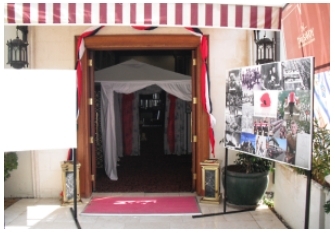 At the entrance to The Savoy Hotel, Kyrenia ballroom, there were many photos donated by RBL members of themselves or family members who served in Aden around that period in time and these would have evoked many memories both happy and sad for those people who viewed them. 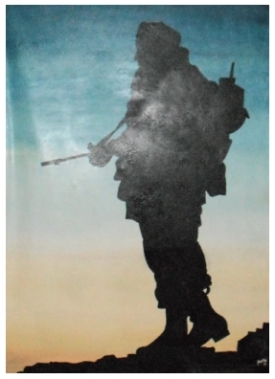 Among the features created for this event by very skilled and enthusiastic volunteers, were paintings of a type 42 destroyer and soldier silhouette which were about 2 meters high and one can only marvel and wonder at the dedication of the artists who created them. There was also a picture of a beach landing which was 1.5 meters square and the Dambuster bomber picture of 1.5 by 3 meters and pictures of Service Badges which were 1 meter square. Attention to detail is a sign of the training of military personnel and this was very evident in the presentation on the dining tables with table numbers which all had images of fallen or injured soldiers starting from WW1 to the present day as a reminder of what the Royal British Legion is about. Helping service personnel and their families. To Muriel Clutten, Jannine Clutten and Martin Ashworth who created and painted these breathtaking showpieces, thanks and appreciation should be given and also to the other volunteers who helped make the Royal British Legion, Kyrenia Branch, Poppy Ball 2013 a great success. and painting these features for this event is just not recognised. This year we had to move the venue for the Poppy Ball with just a few days notice. This move was very regrettable and the need was beyond our control. I must say our RBL team which was helping with this project responded splendidly and the Poppy Ball proved to be a great success. Cyprusscene would like to say thank you to RBL for the pictures supplied which show the work of preparation and with these we have also shown a few more pictures we took of the preparation work of the previous Poppy Ball and from this can be seen the devotion and hard work of those that care. Please view below a collection of pictures showing the preparation for the 2012 and 2013 Poppy Ball and they display the hard work and dedication which is required to make these events so successful. Please also view the video historical account below of one aspect of the British military action in Aden.